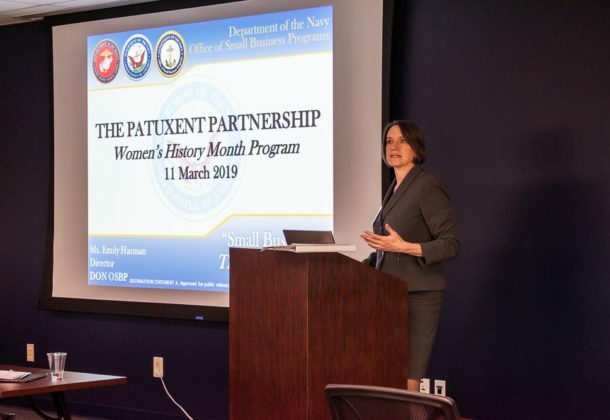 Emily Harman, director of the Navy Office of Small Business Programs, speaks about the contribution of small business to Navy and Marine Corps mission success at a Women’s History Month program by The Patuxent Partnership on March 11. Uncle Sam wants small businesses! That’s the message straight from the National Defense Strategy and delivered to Navy contractors by Emily Harman, director of the Navy Office of Small Business Programs. Harman, who was previously the director of the NAVAIR Office of Small Business Programs at Patuxent River, returned to Southern Maryland during Women’s History Month to talk about “Small Business: The First Option,” a program given by The Patuxent Partnership (TPP). “The small business office is aligned with the strategy,” Ms. Harman said. She went on to describe Secretary Geurts’ success in pushing decision-making authority down the chain of command with the goal of creating a more agile acquisition process. Commands are primed to use small businesses to get the job done, she said, and are expected to take advantage of their additional authority. What matters to those commands, Ms. Harman told the dozens of business owners and representatives in attendance, is what small business owners can do to realize the national strategic goals. In addition to outreach, communication inside DoD is changing as well, particularly in lateral ways the military structure has not easily accommodated in the past. Raising awareness of successes in one command, or even a different service, can be replicated and is useful for finding solutions in other endeavors. “We need to share isolated and short-lived bursts of success,” Ms. Harman said of the Navy’s efforts to facilitate “speed and boldness” across all commands. The newly launched NavalX – another of Secretary Geurts’ initiatives – is an “agility platform” intended to blend the efforts of naval leaders, innovators, and commercial partners to “drive boldness and accelerate outcomes.” NavalX is described as a matchmaker of ideas, resources, and the findings of separate groups working on related projects. DoD is enhancing professional development within its small business professional career fields by creating courses and rotational opportunities. Communication beyond traditional military populations is needed as well. Social media opens up new channels. Small business professionals are setting up at more of the large, annual Navy shows. For the first time, focus on how to do business with the Navy is being included at some of the approximately 15 annual Navy Weeks. Typically held in areas without a fleet concentration, Navy Weeks are designed to raise awareness on the importance of naval service. They offer a series of events that include STEM outreach and recruitment of both military and civilians. Bonnie Green, executive director of The Patuxent Partnership, acknowledged Ms. Harman’s presentation as fitting during Women’s History Month in March, noting Ms. Harman’s contributions in supporting women-owned and HUBZone small businesses entering the DoD contracting arena. As meaningful as these programs are, Ms. Harman said, the most important criteria in acquisitions right now is to address needs in the National Defense Strategy.